Hansel and Gretel were attracted to the candy house so attract you party guests with some creative candy theme invitations. Print out party information on large rectangle labels and stick them on large boxes of candy or candy bars. On large colorful lollypops (6” or bigger) place a large white address label with the party information. Colorful note cards with polka dots on the outside ... write party information on the inside. Decorate the party area in a forest theme with greens and browns or like a gingerbread house with clear glass tall containers and dishes of different types of candy on the party table. Make a sign from poster board to hang on the front door or mailbox that says "Deep dark woods ..." . A trail of white pebbles leading up to the party entrance is a fun detail for Hansel and Gretel. Decorate the outside of the party area to look like a Gingerbread house. Extra large plastic candy canes lining the walkway, strings of colorful lights on bushes, trees and the entryway and large plastic candies hanging from the trees. Cut out "frosting" from poster board and attach around the front door. 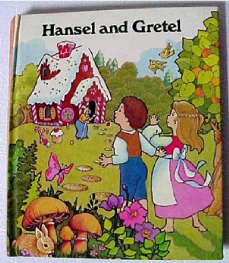 Children may not be familiar with the story of Hansel and Gretel so right after guests finish arriving gather them in a circle and read them the story of Hansel and Gretel. There are also several short plays on the internet that could be used if you have a few willing actors. To keep the audience interested pass out small white pebbles, popcorn and candy to the children during the parts of the story where they are talked about. On a table covered with a plastic tablecloth provide lots of different colors of Play Dough (or give each guest 1 or 2 colors of their own) along with a large container of brown play dough that everyone can use to make gingerbread men. Set out gingerbread men cookie cutters - the larger the better. After they are decorated you can bake them at 200 degrees for 5 min. - they will be hard and ready for the kids to take home as party favors. Tips: Cover the baking pan with wax paper before placing the gingerbread men on the pan. Our great homemade play dough recipe makes this an easy and inexpensive party activity! Let each guest participate in building their own gingerbread house made from graham crackers. Set out squares of graham crackers and royal icing that has been placed in individual baggies with a little hole cut at the bottom for their own pastry bag. Set out dishes of different types of candies and let them have fun making their own creation. For smaller children give them a bowl with candies already in it. Leave clues for the party guests to follow attached to small white stones (like in the Hansel and Gretel story). Let the children go from clue to clue collecting the stones and at the end they can turn them in for prizes or trade for the witch's treasure chest. See our Treasure Hunt games page for instructions and ideas on how to set up a treasure hunt. Before the party hide wrapped candy around the party area. Give party guests small bags and then tell them to search "the woods" for the candy and collect it in their bags. Another fun idea is to tape wrapped candy to a playhouse (plastic or cardboard) and then let the guests try and grab candy off the house. For older children you can have an adult dress up like the witch and play tag while they are trying to get the candy off the house. Instead of candy you can hide jewels (rings, necklaces and bracelets). Chocolate fountain with marshmallow and strawberries (or any snack food) to dip.